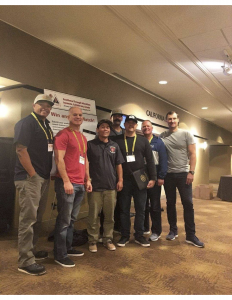 Fire Station 11- 600 Pacific St.
Fire Station 12- 582 Hawthorne St.
Fire Station 13- 401 Dela Vina Ave.
A group of L3707 members recently returned from the IAFF Affiliate Leadership Training Summit in Los Angeles. This conference is two full days of learning, networking, and training to help Monterey Firefighters serve our communities better, keep our firefighters safer, and keep up to date on current issues that affect us all. One current issue the IAFF is working to improve upon is mental health for first responders. Post Traumatic Stress was not often spoken of in the past, leading to firefighter suicide. As an organization, we are working to develop processes for members to decompress after years of stressful calls. We are fortunate to have the IAFF providing excellent resources for this cause. The Monterey City Firefighters serves the residents and visitors of the City of Monterey, City of Pacific Grove, Carmel by the Sea, Monterey Airport, City of Sand City, Naval Post Graduate School and The Defense Language Institute. The department consists of 78 line staff on 3 platoons, 6 Engine Companies, 1 Truck Company and 1 Duty Chief. We also cross staff a fire boat, a OES engine, a wildland engine, an airport AARF rig, and take part in the Monterey County Urban Search and Rescue Team. The IAFF Center of Excellence for Behavioral Health Treatment and Recovery is a one-of-a-kind addiction treatment facility specializing in PTSD for IAFF members – and IAFF members only – who are struggling with addiction, PTSD other related behavioral health challenges to receive the help they need in taking the first steps toward recovery. It is a safe haven for members to talk with other members who have faced or overcome similar challenges.